Bassam Tawil's views on the Palestinians directly oppose the picture presented by the media. When will the media listen. We Palestinians have failed to educate our people on the principles of tolerance and peace. Instead, we condone and applaud terrorism, especially when it is directed against Jews. We want the world to condemn terrorism only when it claims the lives of Palestinians. Abbas's ambiguous, half-hearted condemnations of attacks by Palestinians against Israelis are only intended for public consumption and are primarily aimed at appeasing Western donors so that they will continue channeling funds to the Palestinian Authority. In addition, his condemnations seek to blame Israel for Palestinian terror attacks. Netanyahu's strong and clear condemnation left me and other Palestinians wondering when was the last time we heard similar statements from our leaders. I cannot remember Abbas or any other Palestinian leader ever expressing shock and outrage over the killing of a Jew in a Palestinian terror attack, nor the last time a Palestinian official visited the Israeli victims of a Palestinian terror attack. Each time Abbas reluctantly condemns a Palestinian terror attack, he faces a wave of criticism from many Palestinians. Unlike the Israeli public, many Palestinians often rush to justify, and even welcome, terror attacks against Jews. Has there ever been a Palestinian activist who dared to hold a rally in a Palestinian city to condemn suicide bombings or the murder of an entire Jewish family? The Israeli president has good reason to feel ashamed for the murder of the baby. But when will we Palestinians ever have a sense of shame over the way we react to the murder of Jews? The PLO version of the Walking Dead: The "dead"
It was a pretty embarrassing moment for MSNBC. It isn’t every day that a journalist reporting from the field is reproached by a news anchor during a live broadcast for distorting reality. But that’s exactly what happened last week in connection with a stabbing attempt at Damascus Gate. In case you haven’t seen the viral video, here is what happened: Ayman Mohyeldin, an MSNBC reporter on the far left of the political spectrum who formerly worked for Al Jazeera, was reporting from the field on an incident unfolding before his very eyes. Mohyeldin described how Israeli police shot a young unarmed Arab who was fleeing for no apparent reason. What he did not know was that several seconds before his report a video of the incident, shot on a mobile device, was shown on the broadcast, and it was clear from the video that the Arab was holding a knife. Thus an anti-Israel libel, which would certainly have been widely used for propaganda purposes, was immediately refuted. This incident, which may result in another reporter entering the job market, clearly demonstrates how the current media battle is different from previous rounds of Palestinian terror: This time, everything is happening here, in our backyard, under the watchful eyes of a network of police and mobile cameras. The Palestinians are suddenly discovering that cameras and social networks make it very difficult for them to sell their narrative. Since the sympathy they garner is largely a result of their well-oiled and effective propaganda machine, the current violence may be an error with much greater significance than at first appears. Below are links to videos showing the events of the past few days. We recommend that readers who prefer not to watch these difficult scenes avoid clicking on the links. Abu Mazen, the Palestinian Authority president, discovered the new situation the hard way. In a speech he gave several days ago, he attempted to make Ahmad Manasra a new symbol of Palestinian resistance, emphatically accusing Israel of the “execution of our children in cold blood.” At the same time, Manasra was being depicted on Arab social networks as the new Muhammad al-Dura, a boy Palestinians claim was shot by the IDF during the second intifada in a gun battle with armed Palestinians. But what you can do in Ramallah you can’t do in Jerusalem. It wasn’t long before video clips were posted online showing 13-year-old Palestinian terrorist Manasra with his 15-year-old cousin on a killing spree in the streets of Jerusalem, attacking Israeli civilians with a knife, including a Jewish youth who was hospitalized in critical condition. 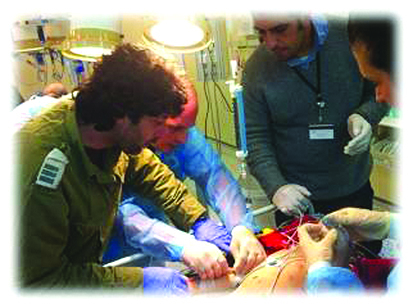 Furthermore, Israel released photographs proving that Manasra was alive and receiving good treatment at an Israeli hospital. An embarrassed Abu Mazen attempted to limit the damage, and an English-language press release issued by his office referred to “the shooting of our children in cold blood.” But even this allegation was quickly exposed when the head of the hospital where Manasra is being treated announced that there were no signs he had been shot. Abu Mazen was caught red-handed, which did not escape the international media’s notice. Even newspapers that are generally far from being pro-Israel, such as the New York Times and theWashington Post, criticized Abu Mazen for the lie of the “living dead.” The Washington Post went even further, with its editorial gently hinting that Abu Mazen is not being truthful (“Mahmoud Abbas has adopted an ambivalent position”) and calling him “irrelevant” in terms of control over the Palestinian “street.” Even prominent Jewish journalist Jeffrey Goldberg, who is firmly on the left, wrote harsh criticism in The Atlantic of the Palestinians’ murderous anti-Semitism, identifying it as the source of the violence. Saeb Erekat, like his boss, accused Israel at a press conference of murdering children. 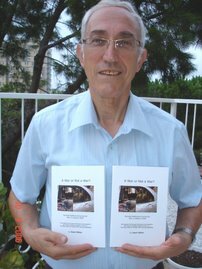 When Erekat, who is head of the Palestinian negotiating team, a member of the PLO Central Committee, and one of the most prominent “partners” of the various peace initiatives, called on the UN to immediately come to investigate the “kangaroo courts,” he was referring specifically to Fadi Alun, who stabbed a 15-year-old Jewish boy and caused him moderate wounds, and Mustafa al-Khatib, who attempted to stab a police officer at the Lions’ Gate and was shot on the spot. In keeping with the accepted practice in Palestinian diplomacy, Erekat added that the Palestinians had begun to gather evidence in order to file a complaint at the Hague against Israel, Prime Minister Benjamin Netanyahu, Defense Minister Moshe Ya'alon, and the head of the Shin Bet. But it appears that even in the Hague they would give greater credence to concrete evidence in the form of bleeding, wounded Jews in hospitals, many Israeli police officers, and civilians present at events while they were taking place. This may be why Al-Hayat Al-Jadida, official newspaper of the Palestinian Authority, was quick to claim that police planted the knife on al-Khatib to justify shooting (the police claimed there were two knives). After all, it is common knowledge that Israeli police are in the habit of shooting random Palestinians and carrying kitchen knives—part of their official equipment—in order to incriminate them. Yhe profiles of some of the attackers, which are revealed immediately on social media, show that reasons such as poverty, discrimination, the occupation, or backwardness do not explain their violence. The attackers themselves, in their authentic public statements, leave no room for doubt that theirs is a murderous ideology and hatred that is essentially religious and nationalist and is directed against Jews as Jews. Who’s Really Violating the Status Quo? While it’s true that the number of Jews ascending the Temple Mount has increased in recent years, the status quo restricts the behavior of Jews on the Temple Mount, not their numbers. In any case, it’s worth noting that the numbers are small: While there have been some 3.5 million Muslim visitors to the Temple Mount in recent years and another 80,000 Christians, only 12,000 of the visitors have been Jews—or in other words, only about 0.3 percent. Anyone who has been on the Temple Mount in recent years recognizes the phenomenon. When Jews approach the center of the Temple Mount plaza, a regular commotion begins: dozens of activists, mainly female, gather around the Jewish visitors, screaming loudly and threatening them. “Al-Aqsa is in danger, Allahu Akbar,” they call out, loudly and rhythmically, in order to interrupt the tour and the tour guide, and in some cases, as the following video clips show, they have spit at the visitors and attempted to attack them. Thus, the Jews enter the complex frightened, in small groups, and with heavy police security. All of them are accompanied by waqf officials, who monitor every movement by Jewish visitors and report to each other using walkie talkies. Recently, the government decided to ban these organizations and to work to dismantle their financial infrastructure. This does not violate the status quo; it defends it. 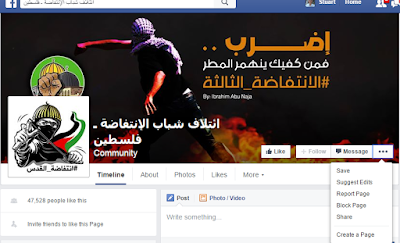 We are seeing more and more use of Facebook pages, photos and videos that promotes incitement, racism and hatred. To report pages on Facebook go to, for example, https://www.facebook.com/intifadacoalition/ and report the page, then ask Facebook to remove them. At the right hand side of the page click on "report page ". What Is It Like To Be Stabbed 13 Times? Imagine what it is like…. to be stabbed. Most of you probably can’t. I can. Because I have. 13 times. With a machete. Firstly, the word “stabbed” does not do the experience justice. In Hebrew it is even worse, because “stabbed” is the same word לדקור that one uses when being “pricked” by a needle. Let’s start with what it feels like. In my case, it felt like a hot poker being bored into my flesh and each time he tugged out the serrated knife, I had the sensation that my bare skin was being raked over with razors. Maybe it would be easier for you to understand if I said it was a pain that felt like my finger nails were being ripped off, over and over again. Then there is the adrenalin. This makes a body tremble, yet conversely it makes it heavy. It’s rather like the moment when we only just escape being in a car wreck or the sensation you feel when you are looking down from the edge of a cliff. It’s like that. Your stomach turns and your blood drains from your head. It feels like this is happening, over and over again. When the “stabbing” is over, there is the cold, the biting cold – due to shock. I remember even the warm December sun felt like ice on my flesh. Every “stabbing” survivor will have felt the cold of death. Then there is the beating. He was hitting, smashing, pummeling, thumping me so hard. He broke over 30 bones. Many “stabbing” survivors have broken bones because of the force with which the attacker plunges the knife into their prey. Then there are the visuals. In my case, I watched for half an hour two sadistic men, (who were once little boys) waving their machetes in the air, teasing us by putting it across their own throats. I remember the sun glinting off the knife, sparkling, flashing in the forest. I remember his dark eyes, dead eyes, indifferent with the sheer boredom of the up-and-coming execution of two innocent, defenseless women. Most of the recent victims did not face their attackers for half and hour, but even a second is enough – seeing that madness on their face, seeing that knife coming towards them – it’s enough; believe me, it’s enough. And watching someone being murdered, is a “sacred” experience, in the sense that you are seeing something that we were not born to see. This is the hardest emotion to even begin to describe. It will take me the rest of my life to articulate what it does to a person. Then there is the taste. A dry mouth: an instant reaction that comes with shock. In my case when he knocked me to the ground, I landed on my face so there was blood in my mouth. There was also bile – one often throws up under extreme fear. I can guarantee that the “stabbing” survivors all had a dry mouth and some may have tasted bile. Then there are the sounds: I heard my bones crunch. I heard my flesh rip. I heard him grunt and pant as he tried to beat me to death and hack me up with his meat cleaver. I heard them scream Allah HuAkbar, I heard myself say “Shema Israel,” and I heard my Christian friend whimper “Jesus help me.” It is terrible to be so helpless and hear someone you love, pray, scream and beg for their lives. It is a terrible thing to hear yourself do the same. Many of the latest “stabbing” survivors have also had the horror of helplessly watching those that they love be murdered in front of their eyes. Many have experienced the loss of self-dignity that comes with begging for your life. There is more to being “stabbed” than meets the eye. I am sharing what it is like, not to invoke sympathy for myself, but rather arouse compassion and a desire to help the growing, daily number of Jewish people who are experiencing to some degree what I did. These are people whose lives will never be the same again, no matter how lightly, moderately or seriously wounded they are. And this, for the survivor, is only the beginning…..
With continuing incitement by the Palestinian hierarchy, it should be no surprise that attacks on Israeli citizens are happening. Further, the video below makes it clear the depths of depravity in creating a culture of hate. 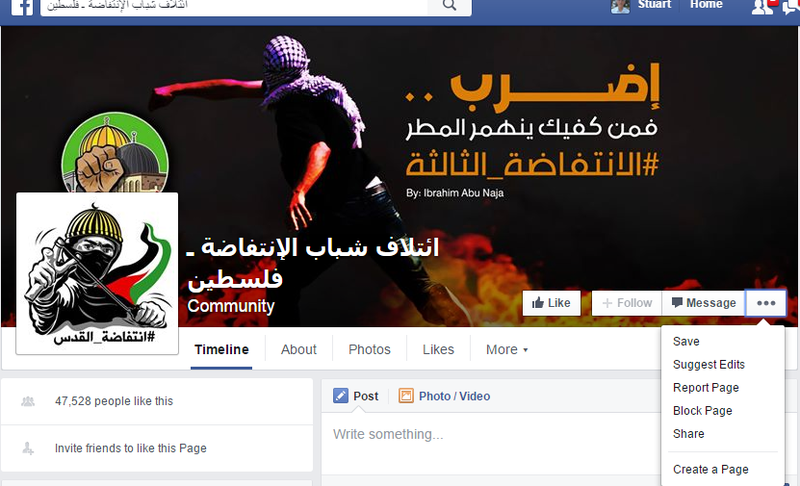 Palestinians have been celebrating the murder of Israelis by distributing the pictures of the killed Israelis and the terror scenes on Twitter and Facebook, according to the official PA daily. The “most significant” picture is that of the dead young Israeli couple Naama and Eitam Henkin who were murdered in front of their four children last week. According to the PA daily, the killing of the couple brings “joy” to Palestinians who see the killing as “heroic”. The recent series of attacks against Israelis is the direct result of incitement by radical Islamist and terrorist elements, calling Palestinian youth to murder Jews. The culture of hate in the Palestinian media, schools and social networks, together with the statements of Palestinian leaders, has reached new and gruesome heights. · The recent series of attacks against Israelis is the direct result of incitement by radical Islamist and terrorist elements, calling Palestinian youth to murder Jews. The incitement includes the propagation of false claims against Israel, in particular about the status quo on the Temple Mount. The culture of hate in the Palestinian media, schools and social networks, together with the statements of Palestinian leaders, has reached new and gruesome heights. 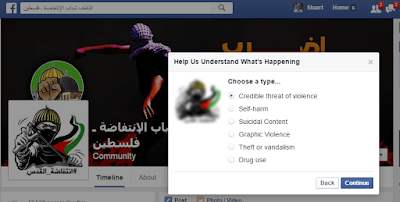 · The Palestinian Authority, including its chairman Mahmoud Abbas, are using inflammatory Islamic rhetoric to spread false and malicious claims against Israel, and treat those who engage in the murder of Israelis as heroes. These statements amount to official incitement to violence and can only serve to exacerbate the situation. · Radical Islamists are bringing explosive devices, Molotov cocktails and other weaponry onto the Temple Mount, thus deliberately desecrating, damaging and endangering the holy site and turning it into a battle field. The militarization of a site revered by all should be universally condemned. The aim of these elements is to change the status quo and to prevent visits by non-Muslims on the Mount. · Israel is making every effort to restore calm. · Israel guarantees freedom of worship in Jerusalem for members of all faiths and is strongly committed to maintaining the status quo on the Temple Mount. Israel has never made any attempt to change the status quo, and any claim to the contrary is a lie. · The status quo protects the right of Muslims to pray on the Temple Mount, as well as the freedom of all people, whether Muslims, Christians, Jews or others, to visit the Mount. Visits to the Temple Mount over the past year included nearly 4,000,000 entries by Muslims, about 200,000 entries by Christians, and about 12,000 entries by Jews. · Israel remains committed to dialogue with the Palestinian leadership and would like to see the renewal of direct peace talks as soon as possible. In the article today ("Dispute Over a Burial Reveals Palestinian Divisions") about internal Palestinian disagreement about the location of Fadi Alon's upcoming burial, The New York Times once again buries Palestinian violence. In the second paragraph, reporters Diaa Hadid and Rami Nazzal identify Fadi Alon as "21, shot dead the day before by the Israeli police." Mr. Alon was fatally shot by police officers early Sunday after he stabbed and wounded a 15-year-old Jewish boy on a road outside the Old City, according to the police. A video clip showed Mr. Alon being shot, apparently as he was trying to flee, with Israeli civilians in pursuit and shouting "Shoot him!" Mr. Alon was the second of four Palestinians killed by Israeli forces since Thursday, when Palestinian gunmen killed a Jewish couple near a settlement in the occupied West Bank, leaving their young children orphans. The article does not make clear that including the would-be murderer Fadi Alon, three and maybe four of the Palestinian fatalities were engaged in violence as they were killed. Among them are Muhannad Halabi, the 19-year-old terrorist who stabbed to death Aharon Banita, 22, and Nehemia Lavi, 41, and who injured Banita's wife Adele, and their two-year-old child as well. The third Palestinian engaged in violence as he was killed was Huthayfa Soliman, who was fatally shot by Israeli forces near Tulkarem yesterday as he and others threw firebomb, firecrackers and rocks at them. It was not immediately clear whether one of the teenagers, identified by a medic as Abdul-Rahman Obeidallah, 15, was involved in the fighting in Bethlehem. . . . According to Army Radio, the military reported that a riot broke out in Bethlehem and that Palestinians had thrown rocks at members of the Israel Defense Forces and the Border Patrol force, which responded by opening fire on one of the Palestinians. . . .
Again, readers of this account have no way of knowing that among the four slain Palestinians are the killer of Aharon Banita and Nehemia Lavi, the would-be murderer of Moshe Malka, and a Palestinian who reportedly was part of a group throwing fire bombs, firecrackers and rocks at Israeli forces. Over the past two-and-a-half years, around 2,000 injured Syrian fighters and civilians have crossed the border into Israel and been admitted to Israeli hospitals. Most are men, but up to 17 percent are children. Since the start of the civil war in Syria in 2011, 70 percent of the country’s medical community has been killed or fled and many healthcare facilities have been damaged or destroyed. Six- and-a-half million people have been displaced to neighbouring countries where they live in semi-permanent refugee camps with only basic hospital facilities. The closest Israeli hospital to the Syrian border – around 40 minutes away in a fast ambulance – is the Ziv Medical Centre in Safed, a university 331-bedded hospital owned and funded by the government. It is the only hospital serving the 250,000 residents of the Upper Galilee and northern Golan Heights and has treated about 550 Syrians to date. 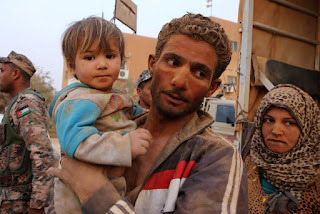 Although the Israeli Defence Ministry described this as an isolated event in which Syrians were being treated as exceptional cases, more soon arrived and what started as a trickle of patients has become a steady flow. IDF patrols pick up the wounded at UN transfer points on the border on the Golan, or in places where the fence is absent or minimal. Staff at the hospital do not know where the patients come from, nor do they want to. “We’re doctors and they are our patients. All we want to do is to treat them,” said Professor Luder. Patients might be suffering blast or shrapnel injury, gunshot wounds or a combination of these and other traumas. Treating such people, often with massive injuries, has its own challenges, not least of which is trying to work out what has happened. “Only two have arrived with any sort of information: blood-stained notes pinned to their blankets. Often diagnosis involves guesswork,” he explained. It takes time for staff to gain the trust of the Syrian patients, and there is a language barrier, although the staff are of multiple ethnicities, matching the make-up of the local community: Jews, Muslims, Christians, Druze, Circassians and Bedouins. After a while, the patients begin to talk to the Arab and Arabic-speaking nurses. 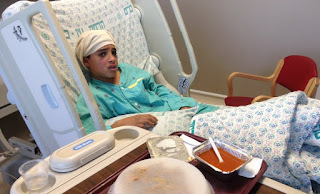 Many patients are terrified, having been told that Israelis are devils. One man, for example, refused to take his sheet off his face for a week. The new head of the hospital held a meeting at which it was agreed more or less by all to continue treating Syrians. Staff felt they had a professional imperative to do so and that it might help build bridges. 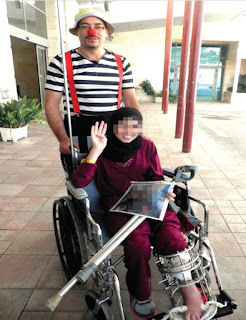 It would also develop their skills for use should they need to treat such severely injured Israeli people. It has not always been easy for staff to balance the medical ethical obligation to treat Syrian patients with their personal feelings. Some thought: “If they can do that to each other, what could they do to us?” Others, though, felt a connection, saying that it reminded them of what Jews went through in the Holocaust. Many of the male patients deny they are fighters, but it is impossible to know. It would be good to be able to say that, following treatment, the fighters have a change of heart about Israel. This, however, is not the case – they might thank staff on leaving, but some still say they will be back to kill them. Others, however, have a different attitude. Luder told me about a girl who was admitted with an amputated right leg and a shattered left leg. The local people donated a prosthetic limb. “She was discharged after eight weeks. Her mother expressed gratitude and a wish to meet again one day, when this troubled region is peaceful,” he recalled. Perhaps the children – some of whom have been born in Israeli hospitals – will share her attitude. 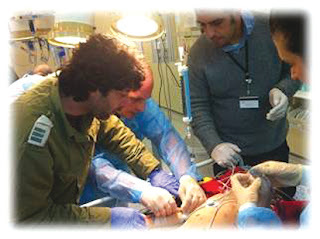 In military ambulance (Syrian patients treated in Israeli field hospitals. 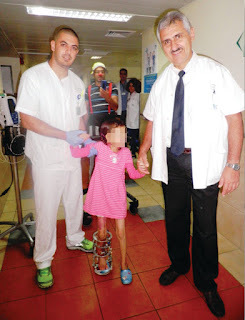 Perhaps the seven-year-old boy who had been told, following 17 unsuccessful operations in Syria, that he would never walk again, will remember how he regained the use of his leg after one operation at Ziv. Word has spread in Syria that people can access medical help over the border from people they consider the enemy and Syrians are filling up beds at Ziv. Syrian patients often stay in the hospital for months, longer than a local person would need, because usually there is no follow up treatment so rehabilitation must be started in the hospital. They leave with a discharge letter in English and all trace of Hebrew and Israel removed from anything they take with them, often including expensive equipment that would normally be returned to the hospital. The treatment of the local community is sometimes delayed and, naturally, people grumble. But they have also responded with generosity. Individuals and businesses have donated money and goods, for example clothes, toiletries, toys and reading material. Each child has a tablet computer to use while in hospital.